One of the things I loved about living abroad was that I could be a tourist all the time. It didn’t seem strange to whip out my camera every five minutes and take photos of buildings that locals just walked by. It was perfectly acceptable to spend my day off in the museum, or visiting the nearby tourist spots. When I returned to England, one of my biggest fears was that I would lose that spirit of “being a tourist”. One of my good friends reminded me how important it was not to lose that quality, and so I decided to start my daily photo blog, Picturing England. It was more difficult to keep inspired when I first came back to England and was living back in my hometown, but now that I am living in London I’m finding that all I have to do is hang my camera around my neck and step out with my tourist head on. I can be anyone I want to be in London. I can be a tourist, I can be an art student, I can be Ali, and it’s ok. London is such a diverse melting-pot of people, and you often can’t tell by looking at someone if they are a tourist or not. Today I was a tourist/art student as I wandered about my city. 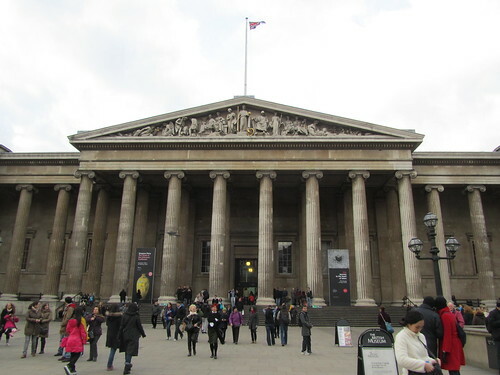 I went on hunts for famous graffiti, aided by Internet searches and the GPS on my phone, and I visited the British Museum. I’m lucky to live in London where there is so much free stuff to do. Most museums and galleries are free (except for special exhibitions), and there are interesting things to be found if you look up at the roofs or down at the corners of buildings, if you’re in the right part of town. So, wherever you live, if you’re starting to feel bored, just grab your camera and get out of the house. Go to where the tourists are, or wander around the back streets. You’ll be surprised what’s been under your nose all this time.